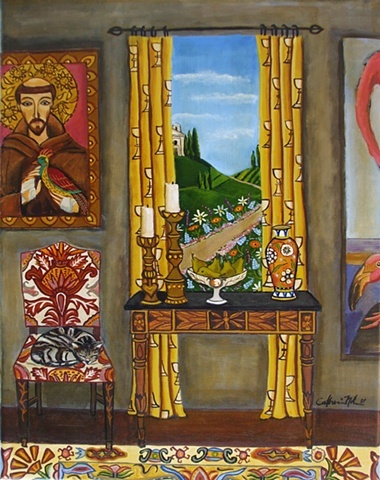 I have painted two or three pieces involving Saint Francis. I feel especially connected to this Saint as many do. My mother, now 82, is not only a devote Catholic but a member of the Franciscan order. My son Samuel’s school is on the grounds of the St. Francis Seminary and was originally a meeting house/sanctuary belonging to the seminary. This beautiful seminary with its lovely grounds and grotto is still next to his school and has just recently closed. I always feel a sense of peace as I drive down the school's driveway as though I am on holy ground and feel as though he is especially protected.